Artificial Intelligence, chatbots and robo-advisors are coming. Here’s an interesting example of how perceptions can yield crazy statistical results. 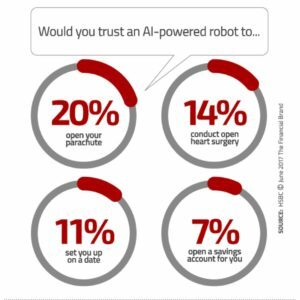 A “Trust in Technology” report published by HSBC found that consumers are leery of allowing chatbots and robo-advisors to help them open a savings account or provide mortgage advice – – but they would trust them more for heart surgery! In an article at The Financial Brand, it’s noted that, in spite of optimistic reports regarding younger consumers’ adoption of digital banking solutions, there are still a host of customers who are distrustful of interactions that are purely digital with no human assistance. The research reveals low levels of trust in such innovations simply because consumers don’t understand them, proving yet again the old maxim that people tend to fear anything new or unfamiliar. HSBC’s study found that a significant majority of people have never heard of new financial technologies, and even if they had, they couldn’t explain what they do. Almost a quarter of respondents (24%) said they have not heard of – nor do they know what “voice activation” technology is, despite it being widely available in consumer smartphones. Indeed, respondents to the survey — of all ages — expressed more fear at having financial data hacked than their fear of serious illness! Share advice and information online (57%). Tell people how the new technology can meet their needs (65%). Make sure people know where they can go for support if the technology goes wrong (74%). Bots and AI are just another indication of how technology evolves. We’ve seen AI applied to recognition technology for years now – – so to our industry, it’s not a huge deal, as it’s been in the background. To see how recognition technology has evolved, check out OrboAnywhere.